PUT HER THROUGH THE PACES. THAT'S ALL RIGHT NOW ON TRUCK TECH. 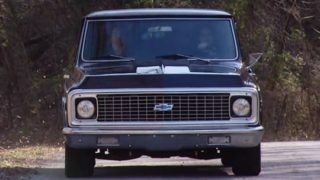 (LT)>> WHEN IT COMES TO DECIDING WHAT PROJECTS TO WORK ON WE LIKE TO LISTEN TO YOU GUYS, OUR VIEWERS, WHO REAFFIRMED OUR LOVE OF THE '67 TO '72 CHEVY C-10. (JEREMY)>> AND FOR OUR TRUCK THAT WE BUILT LAST SEASON, WELL TODAY WE'RE PUTTING IT TO BED, PUN INTENDED. (LT)>> THAT'S RIGHT! NOW THERE'S PROBABLY A COUPLE DOZEN DIFFERENT WAYS WE COULD HAVE BUILT THIS TRUCK, FROM A BONE STOCK NUT AND BOLT RESTORATION, WHICH IS PRETTY BORING, TO AN ALL OUT CUSTOM SHOW TRUCK, BUT WHAT WE REALLY WANTED WAS SOMETHING THAT LOOKS PRETTY UNASSUMING FROM THE OUTSIDE. DEPENDABLE TRUCK WITH A WHOLE LOT OF POWER. WE STARTED WITH A FAIRLY CLEAN TRUCK AND DIDN'T WASTE ANY TIME TEARING IT DOWN. WE THEN UNBOLTED ALL THE SHEET METAL, THE CAB, AND BED. WE BEGAN BY SANDING THE FRAME, PAINTING IT, AND INSTALLED AN AIR SUSPENSION TO LET THE TRUCK SIT LOW TO THE GROUND. TECHNOLOGY DELIVERS HIGH PERFORMANCE WITH GREATER FUEL EFFICIENCY, THANKS IN PART TO DIRECT INJECTION, VARIABLE VALVE TIMING, AND ACTIVE FUEL MANAGEMENT. (JEREMY)>> WE MATED IT WITH AN AMERICAN POWERTRAIN MAGNUM SIX SPEED AND A PRO FIT KIT, WHICH MADE FOR A SEAMLESS INSTALLATION. ONCE IN PLACE, OUR C-10 CAME TOGETHER PRETTY EASILY. (LT)>> WE SPENT A LITTLE TIME BEHIND THE SCENES AND TOOK CARE OF SOME OF THOSE LAST MINUTE DETAILS. THE BRAKES ARE BLED, ALL THE LIGHTS ARE WIRED UP, AND WE GAVE THE TRUCK A COMPLETE NUT AND BOLT INSPECTION. (JEREMY)>> ALL RIGHT MAN, LET'S HIT THE ROAD. (LT)>> HOW LONG DID WE HAVE THIS TRUCK IN THE SHOP? (JEREMY)>> I'D SAY ABOUT NINE MONTHS WE'VE BEEN WORKING ON THIS THING. (LT)>> IT FLEW BY FAST BUT I'LL TELL YOU WHAT, I AM GLAD WE FINALLY GOT THIS ONE DONE AND OUT ON THE ROAD. DAY THIS IS ACTUALLY A HIGH QUALITY PAINT JOB. IT'S JUST GOT THAT ARTISTIC TOUCH FOR WHAT WE WERE GOING FOR. WE KNEW WE WANTED SOMETHING THAT WAS A LITTLE BIT PATINA, NOT TOO CRAZY, BUT JUST ENOUGH TO WHERE, YOU KNOW, WE DON'T HAVE TO WORRY ABOUT IT. (LT)>> AND YOU KNOW FOR ME, HAVING A TRUCK THAT'S MEANT TO BE DRIVEN, THAT'S ALL IN THE DRIVETRAIN, AND YOU KNOW IT. SO PICKING THAT LT ONE CRATE ENGINE, I THINK, WAS THE BEST MOVE THAT WE COULD HAVE MADE. 460 HORSEPOWER! (JEREMY)>> IT'S A BEAST MAN! (LT)>> AND IT WILL GET GREAT FUEL MILEAGE, AND YOU KNOW WHAT, THAT MANUAL TRANSMISSION, SHIFTING YOUR OWN GEARS, THERE'S NO OTHER WAY TO HAVE A SPORT TRUCK REALLY. LATER ON WE'RE GONNA TRAILER OUR C-10 TO THE RACE TRACK FOR A REAL WORLD HIGH PERFORMANCE SHAKEDOWN, BUT BEFORE WE DO, THE LT ONE IS NEEDING SOME CUSTOM TUNING. (ALEX)>> WELL MY SHOP'S NAME IS PIETZ PERFORMANCE TUNES. WE'VE BEEN IN BUSINESS FOR A LITTLE OVER A YEAR IN OUR CURRENT LOCATION. WE CURRENTLY DO TUNING. WE DO ENGINE MODIFICATIONS FOR PERFORMANCE, AND WE DO A LITTLE BIT OF FABRICATION, AND WE REALLY SPECIALIZE IN GM, FORD, AND DODGE. 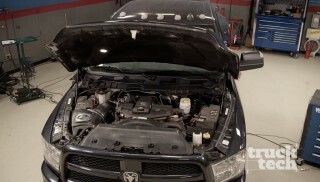 (JEREMY)>> HE PROVED HIS WORTH LAST SEASON ON OUR SUPERCHARGED RAM, TUNING THIS BOOSTED FIVESEVEN HEMI TO 126 HORSEPOWER OVER STOCK. TUNE AFTER ADDING A TURBO, HOT CAM, AND PERFORMANCE EXHAUST. ALEX WENT IN AND MADE ADJUSTMENTS TO FUEL MIXTURE, TIMING, AND BOOST, AND BROUGHT THE POWER UP TO NEARLY 500 HORSES. (ALEX)>> WOW, THIS IS AWESOME! YOU GUYS DID A GOOD JOB. (LT)>> MOST ENGINES LEAVE THE FACTORY WITH A STOCK TUNE. CONNECT THE HARNESS AND IT'LL RUN RIGHT OUT OF THE CRATE. THAT DOESN'T MEAN IT WILL BE OPTIMIZED FOR YOUR SPECIFIC APPLICATION. WIDE OPEN THROTTLE TESTING AND TUNING. (NARRATOR)>> HOW MUCH POWER CAN ALEX DIAL IN? FIND OUT NEXT! (LT)>> WE'RE BACK ON TRUCK TECH, AND IT'S TEST AND TUNE DAY FOR OUR '71 CHEVY C-10 PICK UP. WE ENLISTED THE SERVICES OF OUR FRIEND ALEX PIETZ OF PIETZ PERFORMANCE TUNES, AND BEFORE WE STRAPPED HER TO THE CHASSIS DYNO, ALEX NEEDS TO LOG OUR LT ONE CORVETTE CRATE MOTOR TO MAKE SURE EVERYTHING IS RUNNING SAFELY. HOW DOES THIS LT ONE RESPOND TO SAY A TURBO, OR A BIG CENTRIFUGAL? ALWAYS A GOOD IDEA TO UPGRADE YOUR ROTATING ASSEMBLY, BUT THE POWER THAT YOU CAN GET OUT OF AN LT ONE SAFELY IS A LITTLE BIT LOWER THAN A REGULAR LS. SO IT'S ALWAYS A GOOD IDEA TO UPGRADE THE PISTONS AND RODS AT LEAST. (LT)>> I GOT YOU. SO TALKING ABOUT LIKE A STOCK BOTTOM END LT ONE, WHAT'S LIKE SAY THE HIGHEST SAFE HORSEPOWER YOU GO IN A STOCK BOTTOM END? SAY A GUY JUST BOUGHT A BRAND NEW CORVETTE AND HE WANTS TO BOOST THE THING? 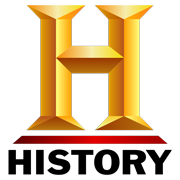 (ALEX)>> AROUND 650, 700 HORSEPOWER. (LT)>> WOW, I MEAN THAT'S PLENTY RESPECTABLE. NEED TO RUN TO MAKE GOOD POWER WITH IT. (LT)>> SO IT SOUNDS LIKE THERE'S PLENTY OF POTENTIAL THERE. (ALEX)>> OH ABSOLUTELY, THEY'RE GREAT ENGINES. THE HEADS FLOW PHENOMENAL, AND THERE'S REALLY NOT THAT MUCH TO BE GAINED IN THE HEADS HONESTLY. NOW EVEN AT SAM TECH WHERE WE TRY TO IMPROVE ON THEM, THERE'S REALLY NOT MUCH IMPROVEMENT TO BE HAD WITH THEM UNLESS YOU GO PRETTY WILDLY. (LT)>> WELL AND THE CYLINDER HEAD IS REALLY WHERE YOU MAKE MOST OF YOUR POWER RIGHT. (ALEX)>> ABSOLUTELY, AND BECAUSE THAT CYLINDER HEAD FLOWS SO WELL, THAT'S EVEN MORE OF A REASON WHY YOU DON'T NEED TO ADVANCE THE TIMING AS MUCH AT WIDE OPEN THROTTLE. (LT)>> SO OUR ENGINE IS BASICALLY A BONE STOCK CRATE ENGINE. 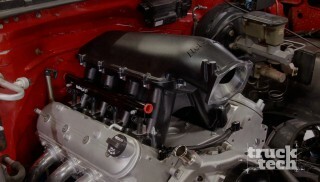 YOU KNOW WE HAVE HEADERS ON IT AND WE HAVE AN AIR INTAKE, WHICH IS, IT'S BASICALLY STOCK. 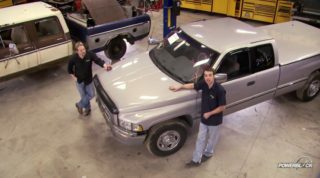 WHAT WOULD YOU, IF YOU HAD TO GUESS, WHAT WOULD YOU EXPECT THIS TRUCK WOULD DYNO AT THE REAR WHEELS BEFORE MAKING ANY TUNING ADJUSTMENTS? (ALEX)>> TYPICALLY SOMEWHERE AROUND 400 TO 415 HORSEPOWER, THAT'S WHAT I SEE. (LT)>> WELL LET'S HEAD TO THE DYNO. LET'S DO A BASELINE AND SEE HOW MUCH MORE POWER WE GET OUT OF THIS THING. (LT)>> ALL RIGHT, FIRE IT UP. BIT OF KNOWLEDGE, IT'S NOT TOO BAD. (LT)>> ALL RIGHT, LET'S DO ANOTHER RUN AND SEE WHAT HAPPENS. (ALEX)>> ALL RIGHT, SOUNDS GOOD. 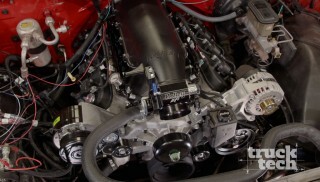 (JEREMY)>> WE'RE AT 417 ON POWER, 428 TORQUE. THAT'S A PRETTY GOOD GAIN FOR JUST SECOND PULL. (LT)>> YOU KNOW THE MIXTURE CAME DOWN. WE'RE ABOUT 13.5 TO ONE. WHAT DO YOU THINK? DO WE NEED TO KEEP GOING? (ALEX)>> YEAH, WE'RE DEFINITELY GONNA NEED TO RICHEN IT UP A LITTLE BIT MORE, GET TO OUR COMMANDED 12.6, BUT I THINK WE'RE DEFINITELY ON OUR WAY. (LT)>> ABSOLUTELY, AND WE'RE HEADING IN THE RIGHT DIRECTION. THAT'S PRETTY GOOD POWER. WORK YOUR MAGIC. (ALEX)>> ALL RIGHT, WILL DO. (LT)>> WITH A QUICK CHECK OF THE DATA LOG ONCE AGAIN, AND A FEW MORE CHANGES IN CALIBRATION, ALEX FEELS OUR C-10 HAS A LITTLE MORE LEFT IN HER. ALL RIGHT, FIRE IT UP, LET'S DO ONE MORE. CROSS YOUR FINGERS. THIS IS THE BIG ONE. (JEREMY)>> I THINK WE'LL GET WHAT WE WANT. (JEREMY)>> IT SOUNDS SO MEAN. (LT)>> MAN TRY GETTING A HONDA TO SOUND LIKE THAT, NEVER DO IT! (LT)>> HOLY COW! 430 HORSEPOWER, 439 POUND FEET OF TORQUE, THAT IS AWESOME! (JEREMY)>> THAT'S A BIG PICK UP FROM 388 AND ALL WE DID WAS PUT A TUNE IN IT. (LT)>> SIX POINT TWO LITER WITH HEADERS, YOU KNOW, MY CUSTOM EXHAUST OF COURSE, AND HOLY COW, THAT'S SOME AWESOME TUNING ALEX. THAT THING REALLY LOVE THE EXTRA FUEL. (ALEX)>> I THINK WE MADE GREAT PROGRESS ON THE DYNO. WE WENT FROM 388 TO 430 HORSEPOWER. YOU COULDN'T HAVE ASKED FOR A BETTER GAIN HONESTLY. (LT)>> GET YOU SOME OF THAT. (NARRATOR)>> EASY DOES IT BOYS. NEXT WE RUN INTO AN OLD FRIEND. (KEVIN)>> AND YOU REMEMBERED YOUR LIGHT SOURCE. (JEREMY)>> MAN THIS THING SOUNDS GOOD. UNLEASHED FROM THIS AMAZING ENGINE PACKAGE. 430 HORSEPOWER TO THE REAR WHEELS IS MORE THAN WE'LL EVER NEED RUNNING UP AND DOWN THE HIGHWAY. AFTER ALL, WE BUILT THIS TRUCK AS A DAILY DRIVER, AND BROTHERS TRUCK PARTS MADE IT EASY TO RESTORE OUR CLASSIC PICK UP WITH NEW SHEET METAL, INCLUDING THIS BRAND NEW BED. (JEREMY)>> YEAH EVERYTHING ABOUT IT. THE AIR SUSPENSION, MAN THE THING JUST KIND OF FLOATS ALONG WITH ROAD, AND THE BIG SWAY BARS THAT WE PUT ON IT. THIS THING ACTUALLY CORNERS REALLY WELL. I THINK IT'LL BE A FUN TRUCK, AND MAYBE SEE A ROAD COURSE IN THE FUTURE, MAYBE? (LT)>> OUR NEED FOR SPEED TAKES A BACK SEAT FOR THE NEXT THING ON OUR TO DO LIST. I'M A LITTLE BIT HUNGRY. (LT)>> I KNOW A GOOD PLACE JUST DOWN THE ROAD, HANG A RIGHT UP HERE. (JEREMY)>> I GOT YOU. GOOD BURGERS? (JEREMY)>> I WANT A MILKSHAKE. (JEREMY)>> YEAH, I HOPE THEY HAVE GOOD BURGERS. ( )>> WELCOME TO JUMBO HOUSE, WHAT CAN I GET FOR YOU? (LT)> HEY THANKS, WHAT DO YOU RECOMMEND? WHAT'S THE GOOD BURGER? ( )>> THE JOHNNY! (LT)>> CAN I ADD BACON TO THAT? (JEREMY)>> THIS GUY, HE'S A LITTLE STRANGE. HE DOESN'T EAT VEGETABLES. (LT)>> NO TOMATOES! WHAT ARE YOU GONNA DO. YOU GONNA HAVE THE WHOLE THING? (JEREMY)>> I WANT THE SAME THING BUT PUT EVERY VEGETABLE ON IT YOU HAVE. (JEREMY)>> YOU WANT A BUN AND A PIECE OF MEAT AND THAT'S IT? ( )>> $4.09 IS YOUR CHANGE. (JEREMY)>> THANK YOU MA'AM. ( )>> THANK YOU, WE'LL BRING IT OUT TO YOU OKAY? (JEREMY)>> ALL RIGHT, THANKS. ( )>> THANK YOU! (JEREMY)>> MAN IT'S GOOD TO SEE IT OUTSIDE. (LT)>> IT'S GETTING LATE OUT, LIGHTS ON. (JEREMY)>> YEAH IT DOES. THE WHEELS SET IT OFF. I KNEW IT WOULD. THE WHEELS LOOK GOOD. THEY REALLY FIT THE STANCE OF THE TRUCK. (LT)>> I'VE SAID IT BEFORE AND I STILL MAINTAIN TO THIS DAY THAT WHOEVER DID THE PATINA ON THE PASSENGER SIDE OF THE TRUCK REALLY KNEW WHAT THEY WERE DOING. I'M JUST SITTING HERE LOOKING AT IT, I'M NOT BIASED AT ALL. (JEREMY)>> YOU DON'T THINK YOU SHOULD MAYBE GIVE ANY CREDIT TO THE GUY WHO KIND OF SHOWED YOU HOW TO DO THAT BY CHANCE? ( )>> ALL RIGHTY, HERE YOU GO. (LT)>> THANKS SO MUCH, THAT LOOKS GREAT. (LT)>> THE SALAD ONE'S FOR YOU, THE REAL ONE'S FOR ME. (JEREMY)>> A MAN THAT CAN'T EAT ANY VEGETABLES. (LT)>> NAH, YOU DON'T NEED VEGETABLES. (JEREMY)>> YOU KNOW WHAT? THAT TASTES ABOUT AS GOOD AS THAT TRUCK LOOKS. (LT)>> YOU SHOULD HAVE GOT THE BACON THOUGH. IT'S GOOD FOR YOUR HEART. (LT)>> I DON'T KNOW IF I'VE SEEN THIS GUY ANYWHERE BEFORE OR NOT. (KEVIN)>> I'VE SEEN IT IN PIECES ON THE SHOW. I'VE WATCHED THE BUILD. IT'S REALLY GREAT TO SEE IT OUT HERE IN THE PARKING LOT. HOW YOU GUYS DOING MAN? (LT)>> THERE'S NOTHING BETTER THAN SHOWING OFF YOUR HARD WORK TO YOUR PEERS. (JEREMY)>> WHAT DO YOU THINK ABOUT IT? CERTAINLY ONE OF THEM. SINCE HIS SHOP IS JUST DOWN THE ROAD, WE ASKED HIM TO COME BY AND TAKE A LOOK. (KEVIN)>> YOU KNOW WHAT I LIKE THE MOST ABOUT IT IS THAT IT'S A NICE MIX OF OLD. THE SAYING EVERYTHING OLD IS NEW AGAIN. (JEREMY)>> WELL YOU KNOW WE WANT TO BE ABLE TO DRIVE THE TRUCK. YOU KNOW, YOU BUILD SO MANY OF THESE SHOW TRUCKS AND YOU'RE SCARED TO DEATH TO GET THE THING OUT OF THE GARAGE? ALWAYS GOT A RAG IN YOUR BACK POCKET, WANTING TO WIPE IT DOWN. WE WANTED A TRUCK THAT WE COULD DRIVE IT OUT TO A PLACE LIKE THIS, GRAB A BURGER, AND IF SOMEBODY PULLS UP BESIDE US AND WE GET A DOOR DING, MAN IT'S NO BIG DEAL. ADDS TO THE PATINA RIGHT? 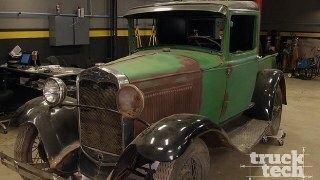 (KEVIN)>> PEOPLE LOSE SIGHT OF WHAT PATINA IS. PATINA IS FADING AND OXIDATION FROM THE TOP DOWN, AND YOU REMEMBERED YOUR LIGHT SOURCE. OXIDIZATION AND SUN COMES FROM THE TOP DOWN. YOUR TOP SURFACES ARE FADED. YOU KNOW, NOT DOGGING THE GUYS THAT DON'T REALLY KNOW, BUT YOU KNOW, THE AIR BRUSH GUYS, THE CUSTOM PAINT GUYS THAT ARE DOING THIS STUFF, THEY UNDERSTAND WHAT A FADE IS AND WHERE THE SUN COMES FROM. SO NICE JOB ON IT. (JEREMY)>> THANKS MAN, I APPRECIATE THAT. YOU KNOW, IT'S JUST THOSE SUBTLE THINGS THAT MAKE IT STAND OUT. (KEVIN)>> PEOPLE REMEMBER BACK A FEW YEARS WE DID A '51 CHEVY AND WE DID A PATINA PAINT JOB ON IT, AND YOU KNOW, THERE'S SOME HATERS OUT THERE, BUT I LIKE IT. IT'S AN EXPRESSION OF SOMEBODY'S ART, AND IT FORGIVES A LOT OF STUFF. IT MAKES A DRIVABLE VEHICLE LOOK REALLY COOL TO WHERE IT'S, IT'S JUST OKAY TO BEAT THE CRAP OUT OF IT AND IT DOESN'T EVEN HAVE TO BE CLEANED. SO I THINK THEY DID A FANTASTIC JOB. MAN IT JUST FITS SO NICE IN THERE. (JEREMY)>> HEY WE APPRECIATE YOU CHECKING IT OUT MAN. (KEVIN)>> NAH MAN, YOU GUYS ARE DOING A GREAT JOB ON THE SHOW. I'VE BEEN WATCHING, I'M GONNA KEEP ON WATCHING. (JEREMY)>> APPRECIATE THAT, WE REALLY DO. (NARRATOR)>> NEXT WE'LL PUT THE PONIES TO THE PAVEMENT. (JEREMY)>> JUST STAY ON THE TRACK. 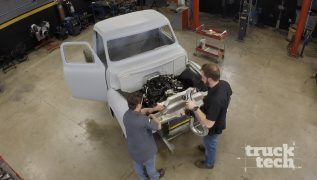 (LT)>> WITH 460 HORSEPOWER UNDER THE HOOD TUNED UP TO PRODUCE 430 AT THE REAR WHEELS, WE NEEDED A PLACE WHERE WE COULD TAKE OUR C-10 OUT TO STRETCH ITS LEGS, AND WE DON'T HAVE TO WORRY ABOUT LOSING OUR DRIVER LICENSE. BOWLING GREEN, KENTUCKY. I MEAN THE PLANT IS RIGHT ACROSS THE STREET, AND SO IS THE NATIONAL CORVETTE MUSEUM AND ITS FAMOUS SKY DOME. YOU CAN BUY A NEW CORVETTE, LEARN ABOUT ITS HISTORY HERE, THEN CROSS THE INTERSTATE AND RUN IT THROUGH ITS PACES AT NCM MOTORSPORTS PARK. IT'S A THREE MILE ROAD COURSE IN TWO CONFIGURATIONS DESIGNED SIMILAR TO LA SARTHE AND LE MAN FRANCE. NOW I KNOW YOU MAY BE THINKING OUR C-10 IS A LITTLE OUT OF PLACE ON THE RACE TRACK, AND HEY, YOU MAY BE A BIT RIGHT. 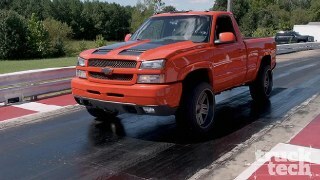 WE NEVER SET OUT TO BUILD A TRUCK THAT WAS CAPABLE OF HITTING THE FASTEST LAP TIMES. 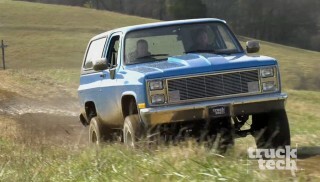 (LT)>> WHAT WE DID BUILD WAS A TRUCK THAT CAN BE DRIVEN HARD, THRASHED, AND THOROUGHLY ENJOYED. NOW WE'RE GONNA TAKE IT OUT FOR A COUPLE OF EASY LAPS TO GET A FEEL FOR THE TRACK CONDITIONS AND OUR NEW TRUCK. 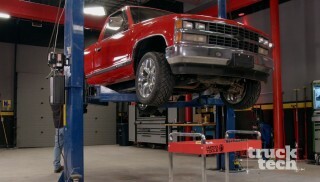 (LT)>> THE SUSPENSION ON OUR TRUCK IS ALL STOCK STYLE, BUT LOWERED WITH AIR SPRINGS. NORMALLY YOU WOULD SEE THIS TYPE OF SUSPENSION AT A CAR SHOW WITH A TRUCK LAID OUT SITTING ON THE ROCKERS. (JEREMY)>> JUST STAY ON THE TRACK! RACE TRACK THANKS TO THE LARGER, STIFFER SWAY BARS BOTH FRONT AND REAR. THEY KEEP BODY ROLL TO A MINIMUM AND THIS TRUCK REALLY STICKS TO THE GROUND. (JEREMY)>> WELL WE'VE GOT A COUPLE OF TEST LAPS ON THE TRUCK. EVERYTHING'S FEELING REALLY GOOD. THIS THING'S GOT A TON OF POWER. IT STOPS REALLY GOOD, AND THAT THING IS GONNA BE A FUN DAY. (LT)>> YOU KNOW IT'S A LITTLE BIT SCARY TO BE A PASSENGER WITH THIS GUY DRIVING, BUT WE'RE AT AN AWESOME TRACK TODAY. WE'RE ON THE SHORTER COURSE. IT'S ABOUT A MILE LONG. IT'S PRETTY TECHNICAL, IT'S AWESOME, AND THIS TRUCK IS A BLAST. (JEREMY)>> MAN LET'S HIT IT! DRIVING, YOU CAN KEEP THIS THING ON THE TRACK. (LT)>> WELL IT'S BEEN A BLAST GETTING THIS C-10 OUT ON THE TRACK AT NCM MOTORSPORTS PARK, AND I HAVE TO TELL YOU I THINK IT'S PRETTY AWESOME WE GOT THIS CORVETTE ENGINE POWERED TRUCK BACK TO THE TRACK WHERE IT BELONGS. AND YOU KNOW TO COME OUT TO A TRACK LIKE THIS AND BE ABLE TO BASH ON IT AND NOT WORRY ABOUT, THAT'S A GOOD FEELING.